“Where are the stink bugs this year?” friends asked in May and June. “Outside breeding so we’ll have a generous supply trying to figure out how to get into our homes in September and October,” I usually replied. 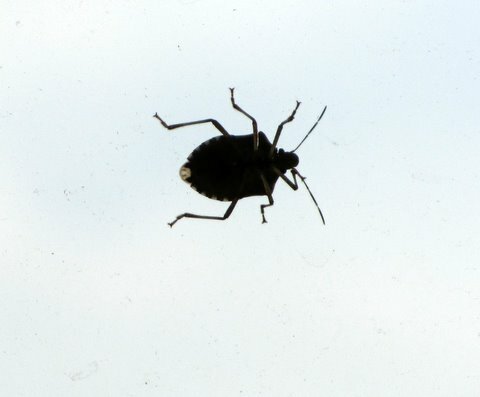 It’s late August now, and the brown marmorated stink bugs have started to show up on our windows and sunning themselves on the western sides of our homes in late afternoon. I’ve seen them all summer, of course, in our gardens. Their favorite foods at Meadow Glenn include tomatoes, raspberries, blackberries, green beans, cucumbers, and squash. In the Tomato Patch, the stink bugs seemed especially attracted to two large-fruited varieties, Virginia Sweets and Brandywine Red. 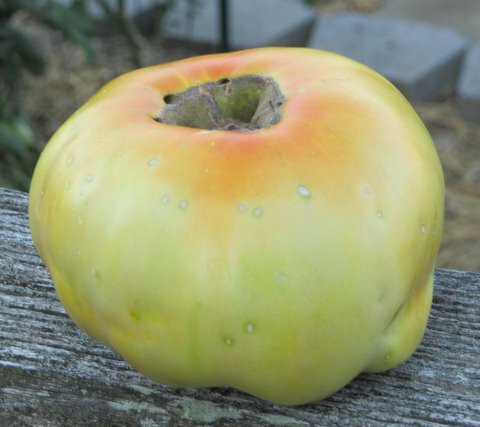 Virginia Sweets is a large yellow tomato with reddish blush. Perhaps I shouldn’t be surprised that the stink bugs like the big yellow because researchers have found the bugs have some preference for that color. I haven’t figured out why the bugs preferred the Brandywine Red to the nearby Brandywine (Sudduth’s Strain) fruit. The small Sungolds seem untouched, though I haven’t used a magnifying glass to verify that fact. The larger red Juliets showed minimal damage, though I think my picking at “breaker stage” this year helped minimize the bug attacks. In mid-June, when I saw the carnage the stink bugs were starting on our berries and tomatoes and realized my daily attempts to control the bugs by drowning them into soapy water was not going to be effective, I balanced the risks and began periodic spraying with a commonly available garden spray, Ortho Max Lawn & Garden Insect Killer (bifenthrin), which lists stink bugs among the insects it kills. I strictly following directions and the more stringent California “days to harvest” after each spray. My decision to use a pesticide was difficult because I have had an essentially organic garden for at least 10 years. Within 10 days the number of stink bugs went from “impossibly high” to “seldom seen.” Last year we harvested few raspberries, and those we did were usually stink-bug damaged. This year we harvested many quarts of beautiful berries. 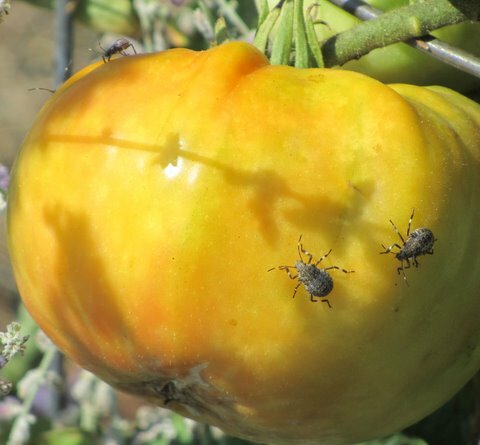 Last year we threw away many of our large tomatoes because of stink-bug damage. This year we have eaten most. Before dawn Sunday morning I found evidence of the stink bug hordes that soon will be seeking ways into our homes for protection from cold weather. As I stepped out of the garage to walk to our mailbox to get the Sunday Post, something caused me to glance up at the overhead night light. 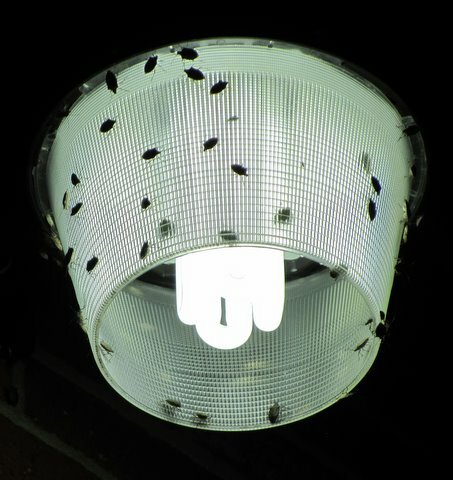 Scores of stink bugs swarmed around the light. Sunday night for the first time in 15 years I turned off the light. Scientists from multiple disciplines are studying brown marmorated stink bugs and how they may be managed. I posted earlier about the EPA’s approval of pesticides for stone and pome fruits and for organic growers and about USDA experiments with tiny, parasitic wasps. An excellent overview of what’s happening is the University of Maryland Extension’s Entomology Bulletin, which details symptoms of the insect’s damage on crops and ornamentals and includes outstanding photographs. To link to the bulletin, CLICK HERE. I've noticed that most of the stink bugs in my garden are attacking my sunflowers and pretty much leaving my tomatoes and peppers alone. Perhaps this is because the sunflowers are yellow? I don't mind them eating the sunflowers because I don't really use them for anything. Brian, what's happen, in your garden is not unusual in Japan. I have had the most damage on my Pineapple tomatoes, which are yellow blushed with red when ripe, and HUGE. I have so far harvested two successfully at breaker stage – the others have been already damaged irreparably when still green. So in that case it seems to be the size rather than the color attracting the bugs. Smaller ones have less damage – at the demo garden, though, even the Sungolds are getting a hit, but we have so many more bugs there.